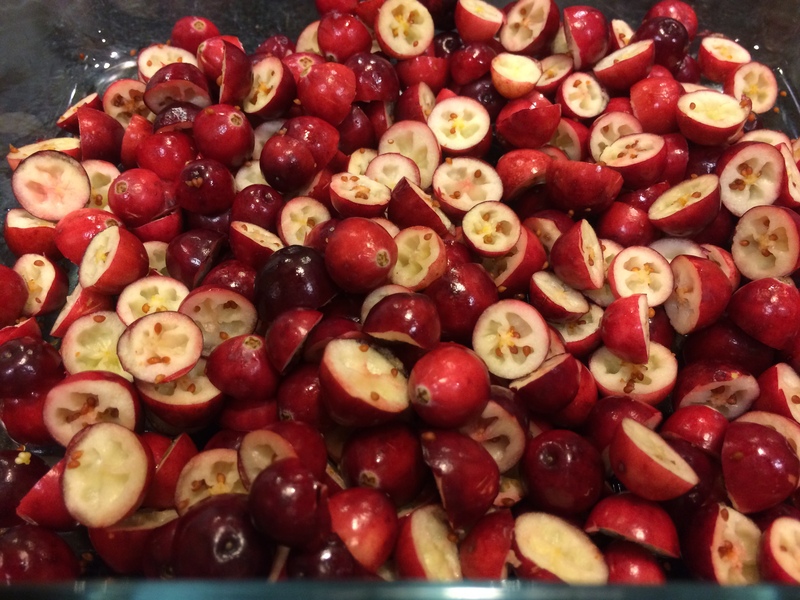 Today in Better-Know-A-Fruit…I will show you some family pictures! This is a family that has origins in Peru and Ecuador, but has pretty much settled all over the world (like a lot of us nowadays), so no matter where you live, you might be familiar with at least one of its members. I have also included my rather dramatic new attempt at an Internet quiz. 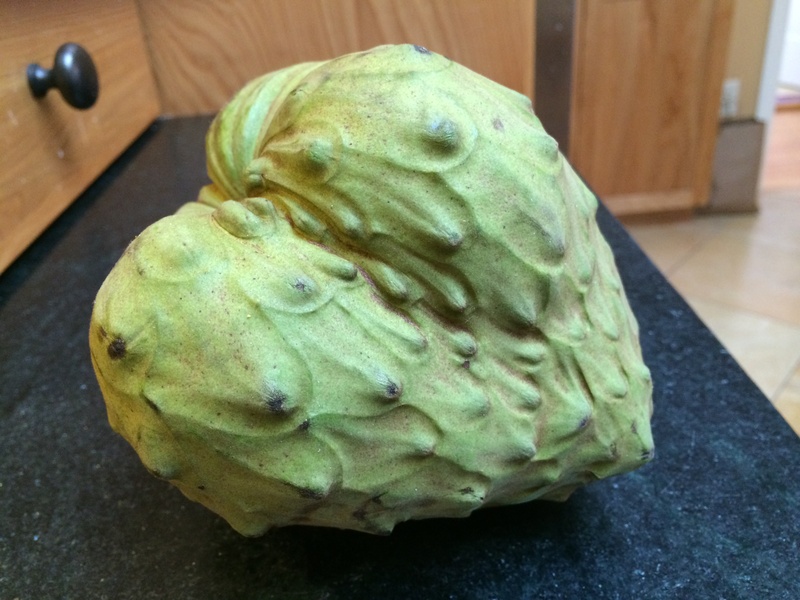 Here is the cherimoya (Annona cherimola). This one is as big as a baby’s head. Found all across Latin America, the flesh is studded with hard black seeds that one must spit out; and white flesh so delicious that the seeds can’t stop you from getting at it. They may try, but they won’t succeed. 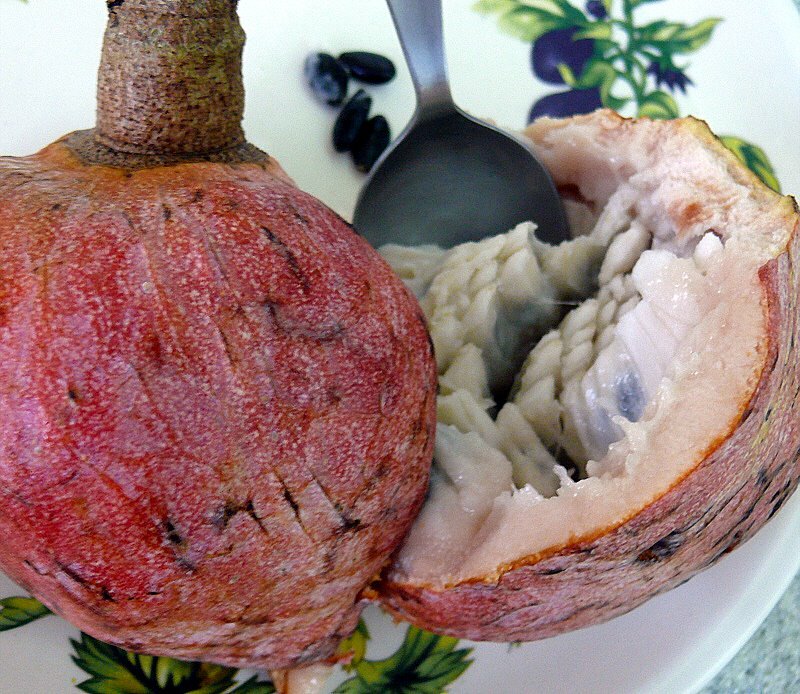 Here is the custard-apple, sugar-apple or Seetaphal (Annona squamosa), found all over Asia. When it is ripe enough one applies very gentle pressure and splits the fruit apart. The off-white custard is studded with seeds. As with the cherimoya, one scoops the flesh up with a spoon as though you are eating ice-cream, and spits out the seeds. Factoid: Seetaphal does not mean ‘Seeta’s fruit’ as the name suggests — Seeta being the heroine from the Hindu epic the Ramayan — instead, the name comes from the Sanskrit root meaning ‘cool fruit’ because of its temperate growing needs. Interestingly, the word ‘cherimoya’ comes from a Quechua word that also means ‘cool seeds’. The Seetaphal was introduced in India by the Spanish in the seventeenth century. Its fortunate name that made it sound like it hung around Indian forests way back in the days of the Ramayan has lent it a very homey cachet. So when relatives of the Seetaphal were found, of course more characters from the Ramayan were used to name them. The next fruit in that family they named Ramphal (Annona reticulata). This is the larger, redder and I guess more masculine-looking? version of the Seetaphal. Also known as the wild one of the pair, it is not as tasty as the Seetaphal. Some call it the bullock’s heart, you can see why. Given that there is a Seetaphal and a Ramphal, could the Lakshmanphal be far behind? This is the graviola or soursop (Annona muricata), known as Lakshmanphal in India. This is now grown throughout the tropics. The flesh is slimy and white just like its cousins, but strangely sour. There have been grand claims made about its ability to cure cancer and conspiracy theories thrown around about corporations that are keeping the news of this medical miracle from us. Status of its cancer-killing claims: undetermined. So whether it cures cancer is unknown, but there are reports that too much of this might actually cause Parkinson’s. Next is the delightfully named paw-paw (Asimina triloba). Not only is this actually one of those rare fruits that are native to the United States, it is actually the largest edible fruit native to the United States. 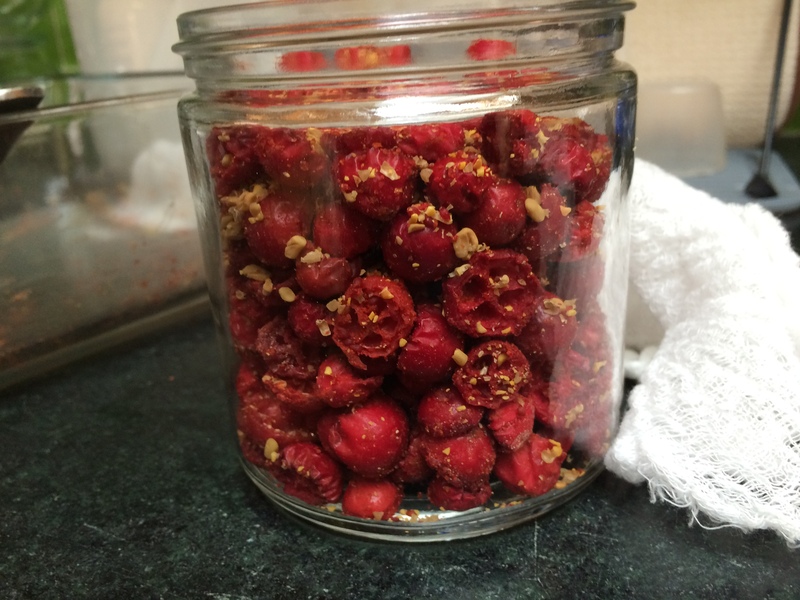 Chew on that for a bit…but do spit out the seeds. 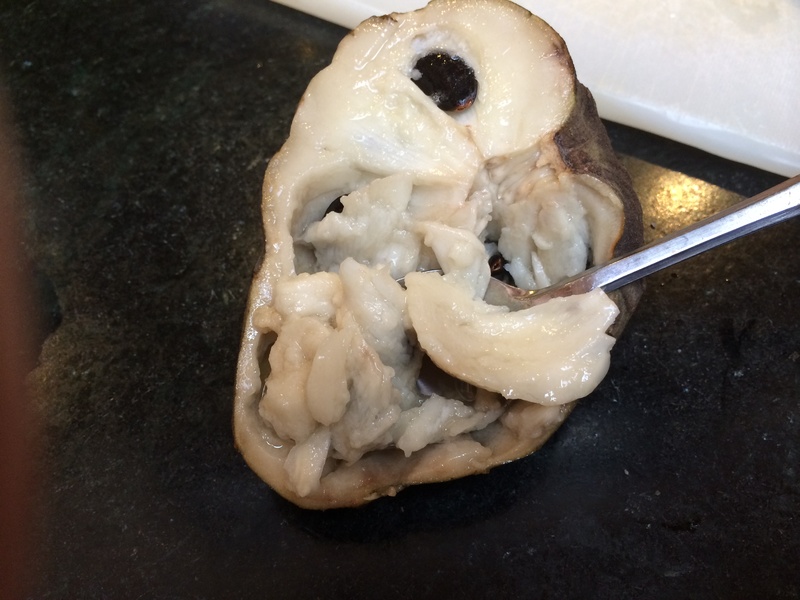 Of course the yellowish, custardy flesh of the paw-paw comes studded with seeds also. This fruit does not ripen off the branch and does not keep well; hence, it is not often found on grocery shelves and must be foraged for. You know who else foraged the paw-paw? Lewis and Clark, that’s who. An even more delightfully named ylang-ylang — but we only care about the flower this time. 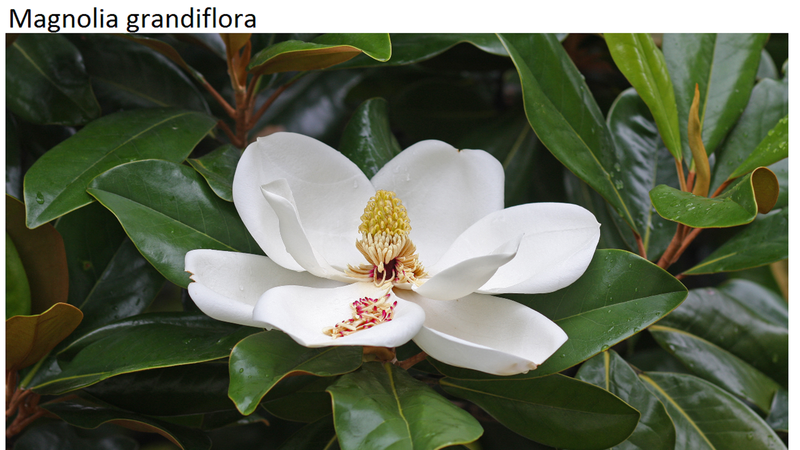 This flower is so fragrant that it has found its way into the rather well-known Chanel No. 5. That was the Annona family, now for a slightly more distant cousin. Australians may be familiar with this one. 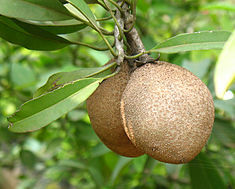 The Bolwarra or the native guava (Eupomatia laurina) is another one of those seed-studded, pulpy, custardy fruits that the flesh must be scooped out of. 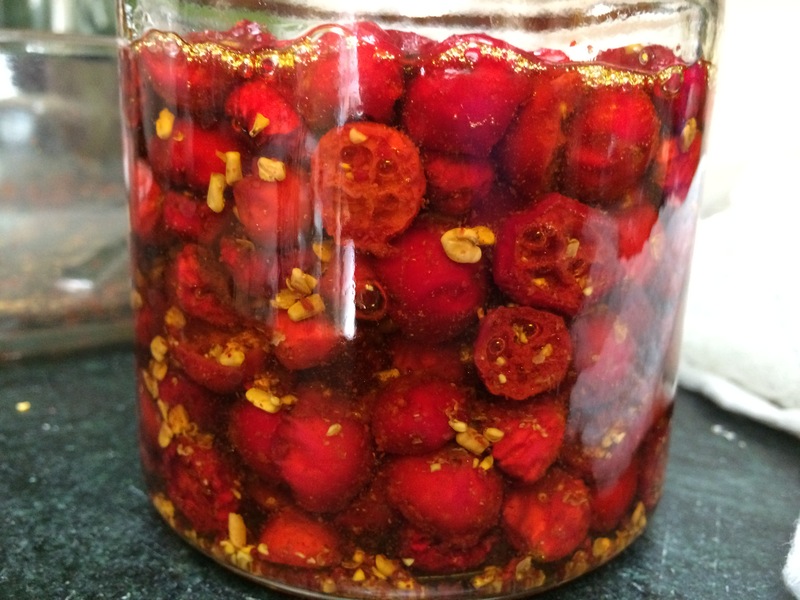 This is often used in jams, jellies and beverages. I have never tried it myself, so, much as it would delight me, I cannot report first-hand on what it tastes like raw. Like all families these fruits share certain traits. The custardy flesh tends to have floral notes like that of roses. As soft as banana or avocado flesh, it is faintly gritty. They would not work well in fruit salads but would be great in ice-cream. 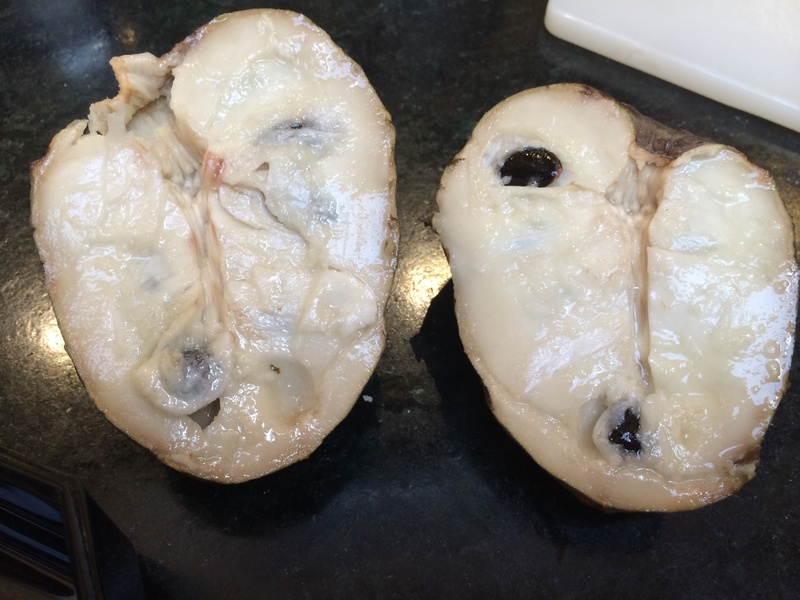 They must be eaten when fully ripe, but when overripe they start to ferment and taste slightly alcoholic. These fruits tend to have a cone-like or bulb-like appearance, and to me look sort of like a clenched fist atop a super-thin wrist. Botanically, these fruits are interesting too. They tend to have fragrant flowers (remember the ylang-ylang?) because they need to attract beetles by their scent, in order to get their…ahem…male parts into their female parts. Pollination, for the squeamish. The other champion pollinators of the insect kingdom — the bees — these plants have no use for. They were invented before the bees, do not produce nectar for them, their flowers don’t accommodate them, and are basically invisible to them. Did any of you wonder why these bloody fruits absolutely must be studded everywhere with seeds? Couldn’t they at least try to be convenient like the other fruits and cluster the seeds in the middle? No — because they aren’t a single fruit at all. 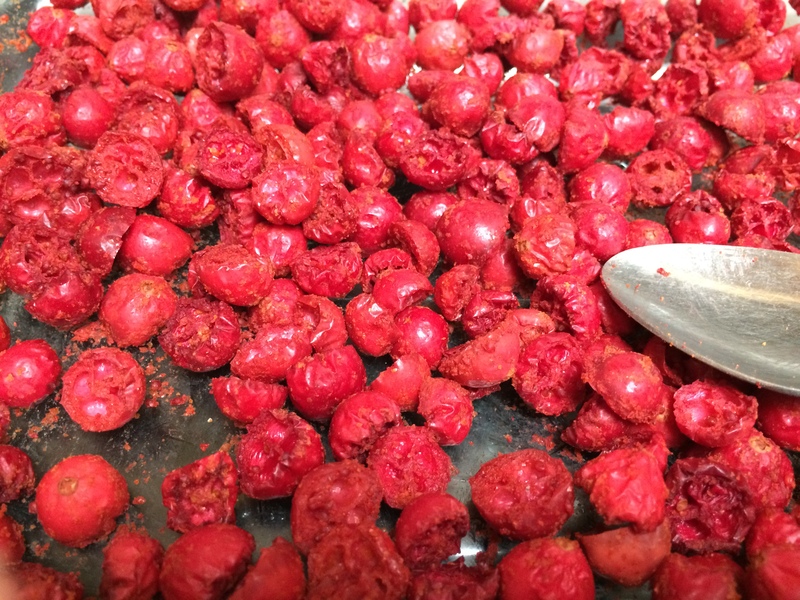 Millions of years ago separate fruit in these plants got fused together into one — so they are all aggregate fruits. Now for the quiz! Excitement! Big font! Flashy gifs! Here is a relative of this seedy family that should be a rather familiar sight to most North Americans. This one is not edible though unless you are a bird. Can you guess what it is? Click on this link to find out! If you guessed right award yourself 14 Odd Pantry points. That’s right, 14! Aren’t I generous! You can redeem them at any time by writing to: The Editor, The Odd Pantry, the Internet. There are some Westerners who go to India and fall in love with being Indian. They make all sorts of claims about their souls being Indian, or having been Indian in some previous life time; and, if you think about it, there couldn’t be a better proof of feeling Indian than throwing around claims about previous life times. Some start to wear rudraksha beads and saffron robes. The more extreme among them might take on a Hindu name. We have all met at least a couple such people; if not, visit your nearest ISKCON and you will. 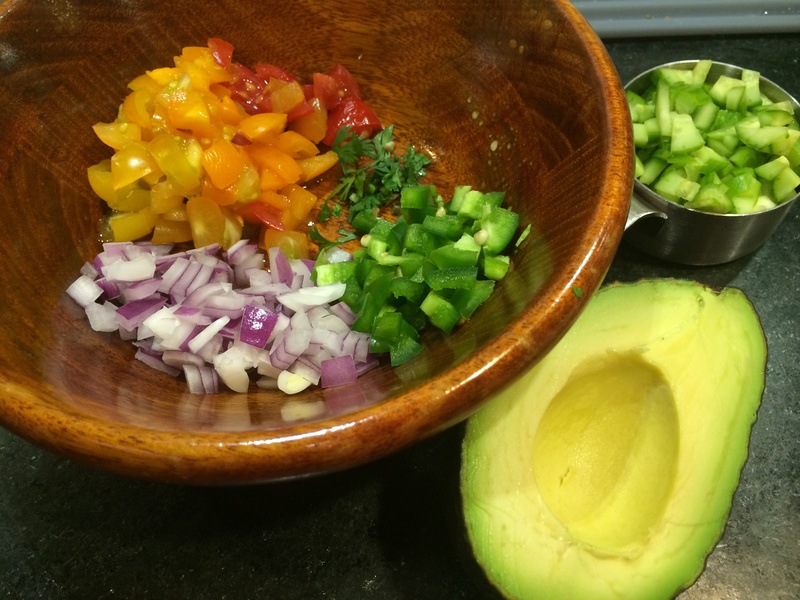 But today I will introduce you to one such friend of mine — the avocado. This fruit with buttery green flesh is native to Mexico. To me, the taste of the avocado has always been reminiscent of the flesh of young coconut: the kind you stick a straw in first to drink up the water and then the coconut-wallah scrapes the flesh off from the inside and hands it to you, using the shell as a bowl. But stick it in a saffron robe and you would think this fruit was born and raised in India. It takes well to a number of Indian preparations. Mix it with yogurt to make a raita. Stick in a paratha. 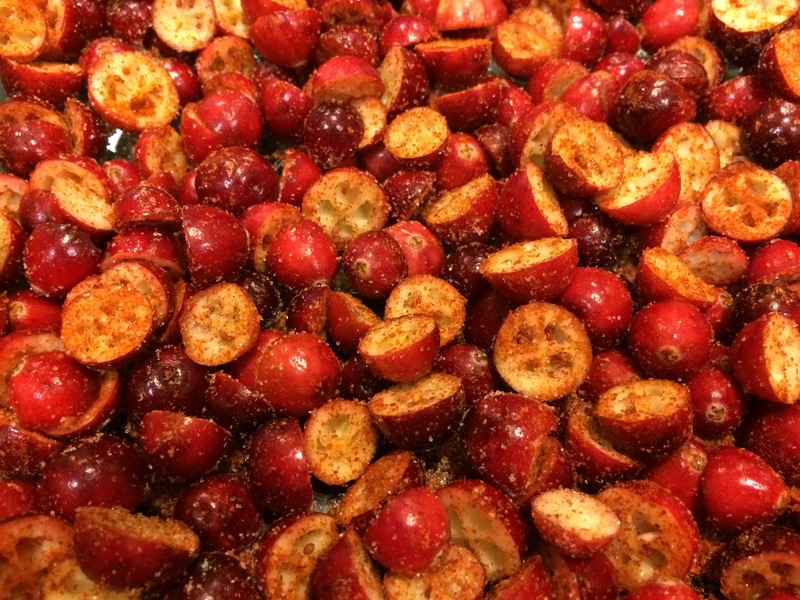 Spice it up to make chutneys. As I experiment I will be blogging about various Indian treatments for the avocado. 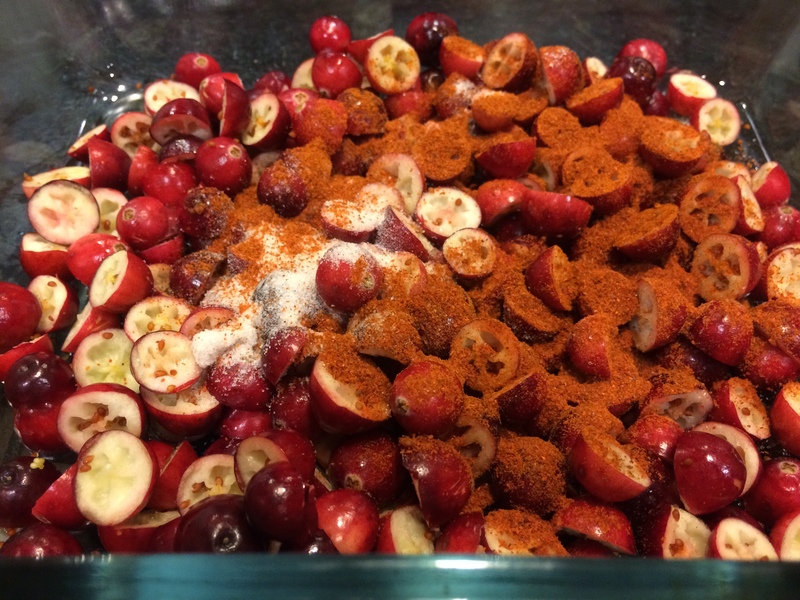 But today, I will make that quintessential fresh accompaniment to rich and heavily spiced food — the kachumber. Kachumbers are little salads or relishes that emphasize freshness and coolness. A bite of this is supposed to freshen your mouth during the meal. It usually consists some combination of onion, tomato, cucumber with lime juice. Try it with avocado, as below; it brings the taste of kachumber up to lusciousness. This makes enough as a dinner side for two. Couldn’t be simpler. Mix it all up! We had this as a side to fish and rice. Post script: Although I first tasted the avocado only after I came to California, where it grows easily even in home gardens, it turns out that avocado grows in India as well, under the guise of butter fruit. It seems to be known mostly in the south, and is only available during August and September. It also has trouble hitting that right moment of ripening — sometimes the fruit rots before getting there. But if you see it, do purchase it! I have by now spent an enormous number of years on this planet, more than I care to admit, and about half of that time has been in the United States. But there are still occasional things that pop up to surprise me. This time it was a pink egg. 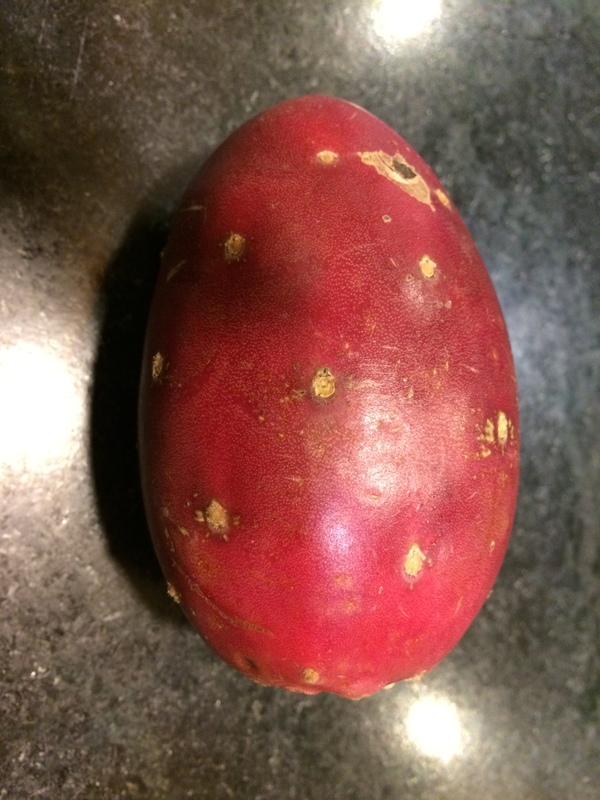 A giant, pink, mottled egg that sat all by its lonesome in a farmer’s stall in a market. Visions of pretty pink birdlings hatching out of it floating before me, I purchased it. Who could resist? Clearly there are many, many gaps in my knowledge. But thanks to Mr. Farmers Market, I have filled one small gap. Nopales or ‘prickly pear’ is a type of cactus that is native to Mexico. It has giant green oblong pads covered in spines. The pads are chopped up and eaten as a vegetable (very often by me, in my burrito). These pads produce pink egg-shaped fruit. 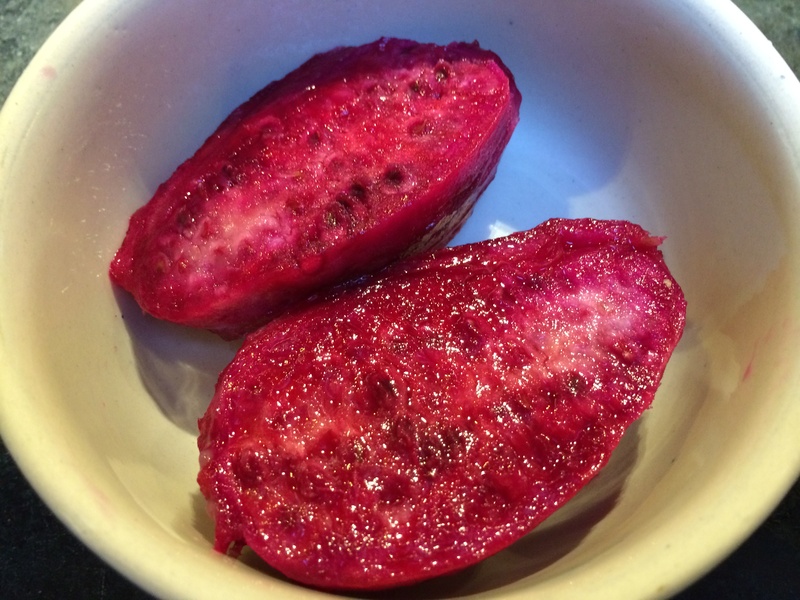 This prickly pear fruit is what I saw that morning at the market. The way one eats it is — first, before all else, remove the spines. Now this was already done for me at the market, and if you are lucky this is how you will find the fruit sold. Next, peel off the outer thick peel, which comes off quite easily with a paring knife. 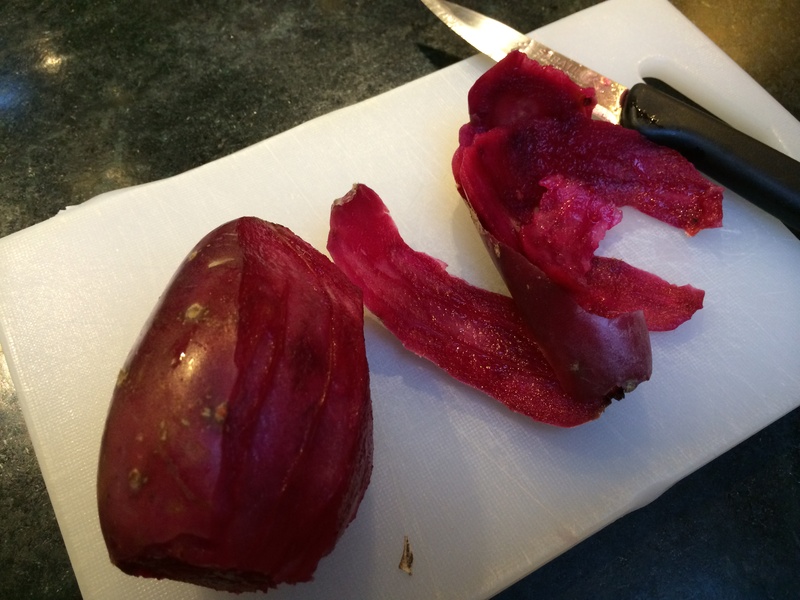 Inside, you find flesh of a deep magenta, granular and with high water content. 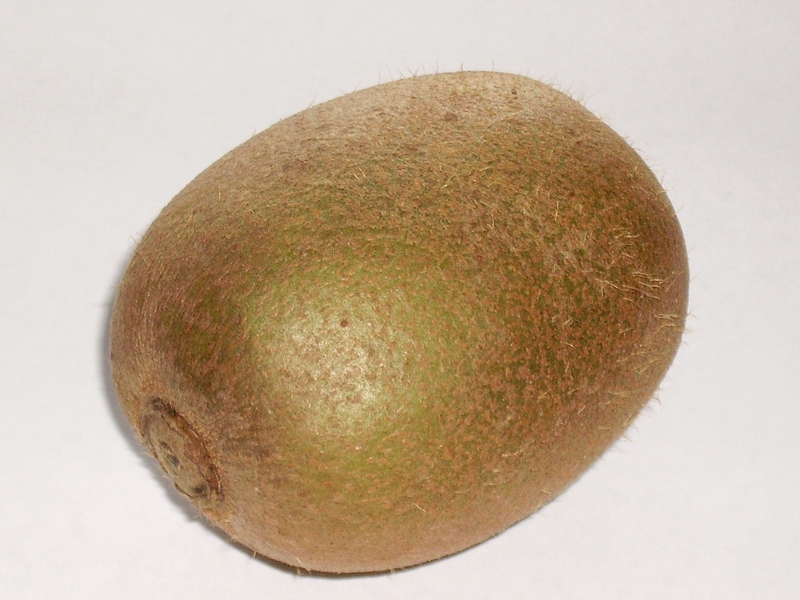 The texture resembles kiwi or watermelon. The flesh can be eaten raw. But it has small round seeds studded throughout the flesh. There is actually no way to avoid eating the seeds, which to me were a nice crunchy backdrop to the melony flesh. But I can see that it would bother the squeamish. The seeds do limit it use in things like fruit salads and pies. How was it to taste? Very unobjectionable. It has a mild flavor and is not terribly sweet. Apparently it is a nutritional powerhouse with high amounts of vitamin C, magnesium and calcium. I do sense that there is some hype surrounding its magical restorative properties on the interwebs though. Other than eating it as is, here are a couple things you can do with it. 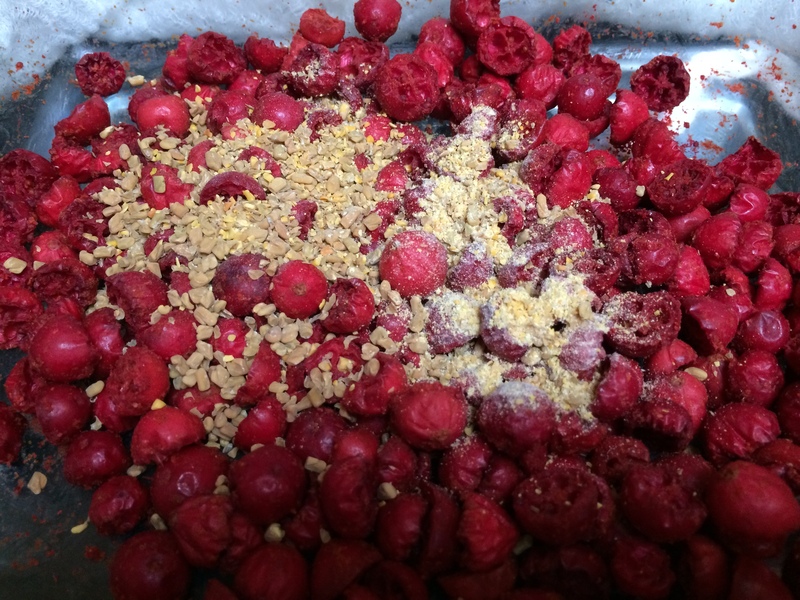 Juice it in a blender, then strain out the seeds. I believe you will want to sweeten the juice and perhaps liven it up with some lime or lemon. Another trick was suggested to me by Mr. Farmers Market: put some cubes in some clear filtered water; this will quickly take on the deep magenta of the fruit while the flavor is affected in a very mild way. 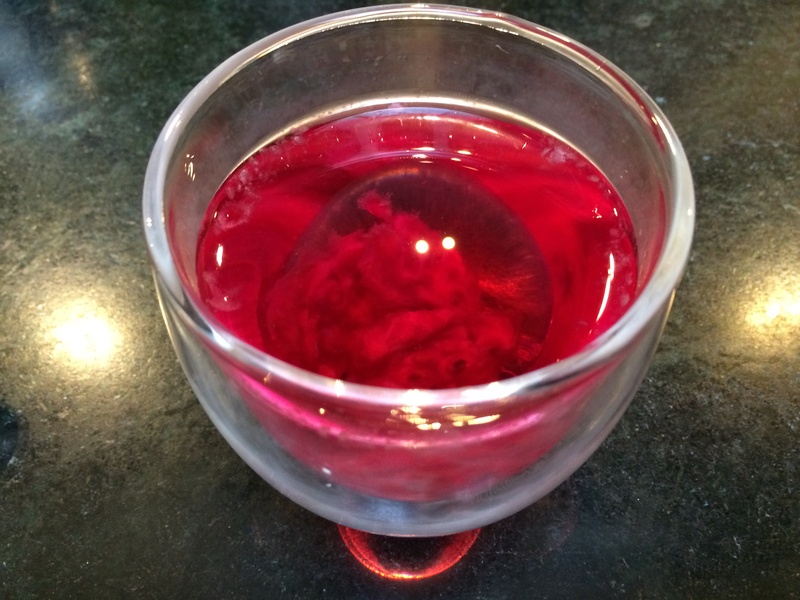 A good way to make a base for fruit punch, or, perhaps drinkable ‘blood’ for Halloween. ¹I have since discovered that in a typical cactus, the leaves have been adapted into the spines, while the stems have adapted to form the green (photosynthetic) part — usually the succulent, squat structure that bears the spines. This is called the areoles. So in the nopales cactus, the vegetable part that one eats is the modified stem. Now it is no mystery that the egg-shaped fruit comes attached to what I believed to be the leaf blade: that is indeed, the stem, and the fruit grow from the stem in the usual way. and the flesh tastes like a dryish banana. To eat it, you peel off the thin brown skin and eat the brown flesh. Not bad to taste, but my mom made me eat them a lot and I still recoil from the poor chickoo for that reason. Don’t let me dissuade you from trying this excellent fruit, though; it will lower your cholesterol and blood sugar while being the cause of some yumminess. Do yourself a favor and buy some if you see them being sold anywhere, but I do have to warn you, the seeds look suspiciously like cockroaches. Ha! Wrong again. Berry No. 2 is Jamun. I know jamun well. It terrorized my tongue many a time with its tingly astringency. I never thought I would ever crave that nasty fellow, but I do now — now that I can’t have it. 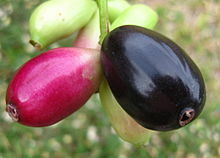 Jamun’s correct name is Syzigium cumini. It is native to India but has become a weed in various places such as Hawaii and Florida. Apparently it has also spread around Brazil, and Brazilian birds have developed a taste for it; I think it is because they don’t have much of a tongue to terrorize. That leaves Fruit No. 1 and Berry No. 1. First clue — they are cousins. Clearly Fruit No. 1 is no mystery. It is the kiwi. We usually identify it with Australia (perhaps the name has something to do with it?) but the kiwi is actually native to China. It is rather new to the wider world, having just become known around the twentieth century; since then it had a rash of branding and re-branding — a problem that only a modern fruit could have. 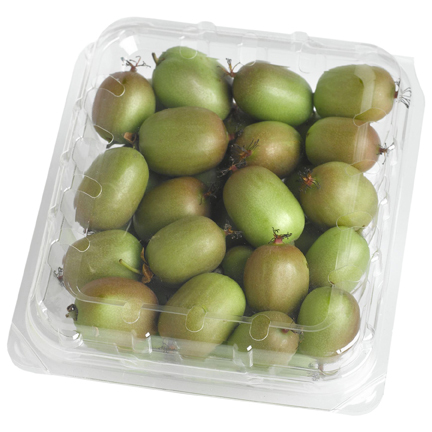 It went from being known as yang tao, to Chinese Gooseberry, to Melonette, to Kiwi. That’s right! Berry No. 2 is a kiwi berry. Fruit No. 1 and Berry No. 1 are close cousins. Both belong to the Actinidia genus. 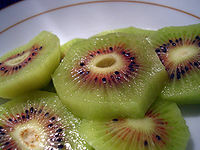 This is closer than belonging to the same family; in other words, the kiwi and the kiwi berry are about as closely related as the lion and the tiger to each other (both belong to the Panthera genus). Eating the kiwi berry was a satisfyingly schizophrenic experience. Tastes just like a kiwi inside, but there is no need to peel it, the skin is edible and remains so when it ripens fully. A wash-and-wear kiwi! Excellent.